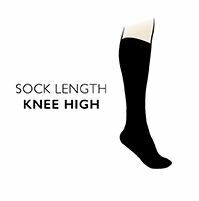 Available here as a convenient twin pack of 40 denier thickness knee highs, Iomi Footnurse Energising Compression Socks are made in a graduated compression to assist in supporting tired, aching and fatigued legs by giving them a circulation boost. These nylon-based matte finish socks reduce in compression as they climb the leg, moving blood in the right direction, supporting muscles and relieving swollen feet and ankles. Our Iomi Footnurse Energising Compression Socks have Factor 10 compression at the ankle (at a circumference of 24cm), and are UK-made, with a soft feel and a comfort toe seam. We would advise that they are not suitable as a replacement for flight socks however – please see our SockShop Flight and Travel Socks instead.